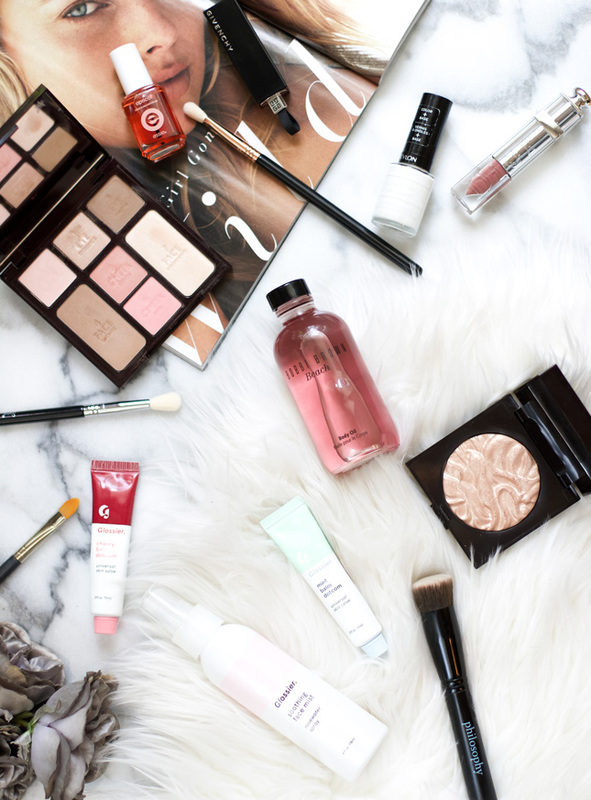 In this month’s Lovin’ Lately we’re talking natural makeup, summer nails, everyday makeup brushes and an acne cream that transformed my skin. Last month I shared a few of my favorite Instagram makeup accounts and told you guys all about my love for looks created by Ania Milczarczyk. I just love the things she does with skin, and the fact that her models look natural, yet their beauty is defined and they all have that amazing glow to their skin. When it comes to wearing makeup I kind of have two moods: I either don’t wear much at all, or I wear A LOT (like false lashes and all). For the first time in years, my skin is completely clear and I can get away with using light bases and minimum coverage foundations. So, for the last couple of months I have been experimenting a lot with my makeup and trying to go for that same (or similar, rather) glow that Ania creates. Few days ago I reviewed Charlotte Tilbury’s Instant Look in a Palette– I’ve been using it pretty much daily since I got it. 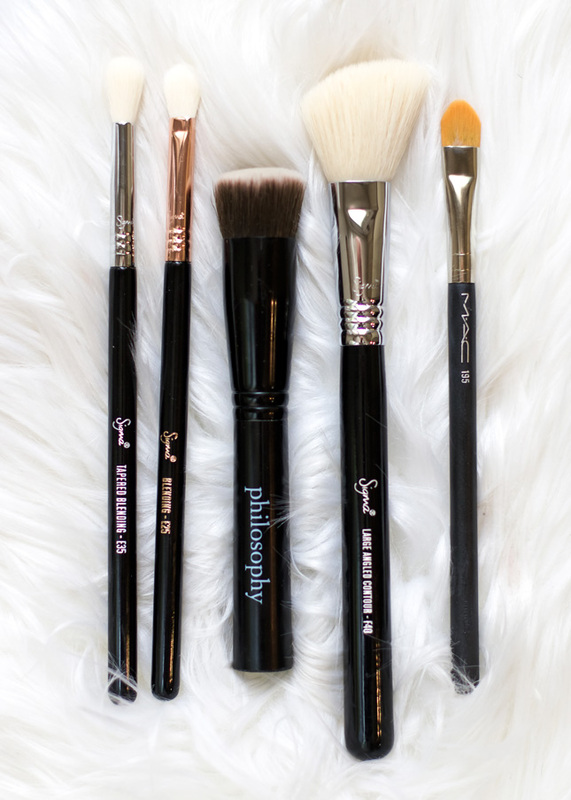 It’s perfect for creating natural, delicate looks. For that extra glow, I dug out my Laura Mercier’s Indiscretion Illuminator. It has that stunning, rose-gold glow and the texture is incredibly smooth. One of my favorite lip products last month was actually a drugstore product: Maybelline Color Blur Cream Matte Lip Pencil in I Like To Mauve It. I love the formula of these pencils and this color is definitely my favorite. It’s a great everyday shade that really reminds me of one of my favorites from the NYX Matte lipstick collection: Audrey. For a sheer touch of color I’ve been loving Givenchy’s Rose Caprice and for something glossy (but not sticky): Dior’s Fluid Stick in Avant Garde. Since my makeup has been on the minimal side lately, I’ve also been using fewer tools. Pretty much the only five brushes I’ve been using lately are: Sigma E35, Sigma E25, Philosophy Supernatural Airbrush Finish Brush (which is sadly no longer available, I wish I bought two of these- it’s probably one of the best foundation/cream product brushes I’ve ever used), Sigma F40 and MAC 195 Concealer Brush. I also still reach for my Beauty Blender all the time, but I’ve been loving that Philosophy brush with some of my light-coverage products. Every single summer, I also dig out my favorite white nail polish: Revlon’s Sure Thing (see my review and swatches right here). I love rocking white nails during summer, but most white nail polishes are so difficult, if not impossible, to work with. Sure Thing is the only white nail polish that isn’t streaky or watery- basically it’s the only white nail polish I’ve used that doesn’t look like whiteout when applied. You guys know that I love using Argan Oil on my cuticles on my hands, but on my toes I’ve been loving Essie’s Apricot Cuticle Oil– it’s great to use between your pedis, if your cuticles tend to get dry. Summer means that we’re all be wearing cute sandals all the time and if your cuticles get dry I definitely recommend you try it. I love that it comes in the same packaging as a nail polish, too since it makes for a mess-free application. Now, let’s talk a little about skincare. 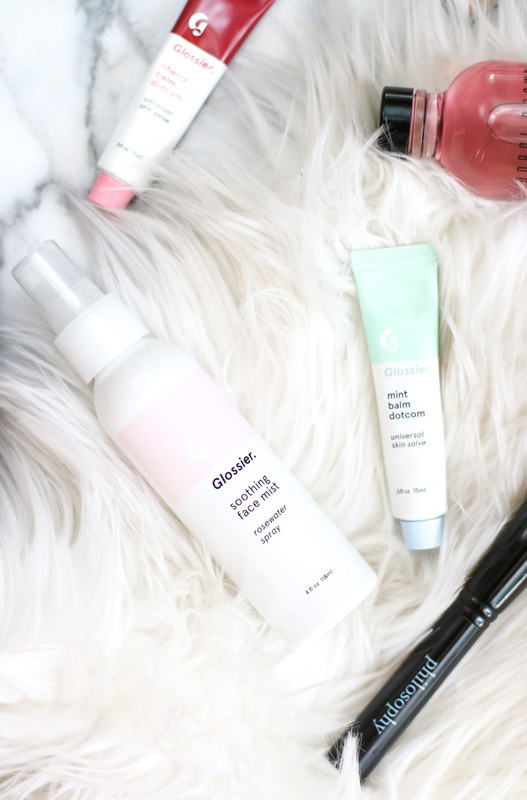 It’s no secret that I love face mists, and one that I’ve been really loving recently is Glossier’s Soothing Face Mist. It’s such a nice product for this time of year, when you need a little midday pick-me-up and I love using this before my serums and moisturizers. 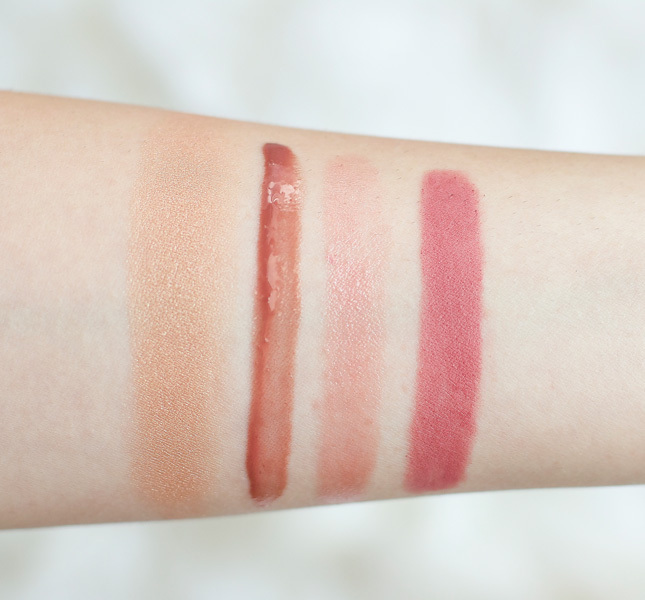 I also got my hands on Glossier’s new Flavored Balm Dotcom Trio in Rose, Cherry and Mint and I really like them- Rose being my favorite, duh. These aren’t really groundbreaking products, but they do a good job at soothing dry lips- all three also smell amazing. By the way, you can get 20% your first Glossier order, using this link. I’m also crazy about Bobbi Brown’s Beach Oil– it feels so amazing on my skin and has such a nice scent, but I’m not sure how I feel about the packing. It comes in a glass bottle which is undeniably beautiful, but it kind of makes the product application a little messy- plus, greasy hands + glass bottle don’t mix well. Still, it’s a very lovely product- love using it on my legs after a shower. I wasn’t sure whether or not I should mention this product here on the blog since it’s not available over-the-counter, but this did such amazing things for my skin, I thought I’d mention it anyway. I’ve been using Tazorac for about three months now (it was prescribed by my dermatologist) and my skin hasn’t looked as clear as it does now, in years. During the Memorial Day Weekend we had a couple of friends come over for a barbecue and drinks and I didn’t wear an ounce of makeup the entire weekend. I’m usually so self-conscious about my skin and this weekend I was actually able to relax, have fun, not worry about any touchups, or constantly checking myself in the mirror, making sure my fun coverage foundation isn’t fading or looking cakey. It might sound silly to some of you, but to me, this was big. For years and years I wore a full face of makeup even when going to get a few things from a grocery store- so now, having everyone tell me how great my skin looks is just an awesome feeling (my mom even asked if I’m wearing foundation when she came over!). I already talked about my routine and my derm visits over on my snapchat (@Paula13t) where I give a little updates. 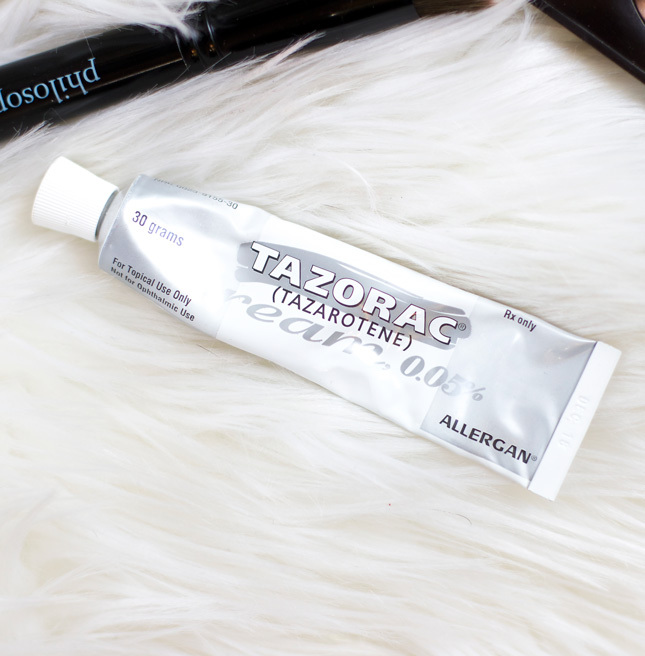 Usually, Tazorac can cause the skin to get very dry and irritated, but I *thankfully* haven’t experienced any of the side effects, which is probably because I’ve previously used retinoids on my skin- none of which worked as good as Tazorac. This little cream is a miracle worker (my doctor was considering putting me on Accutane so I’m so happy that we tried Tazorac first!) my skin looks so clear and healthy, I’m just left with some scarring. Once my skin is healed completely, I’m hoping to get some laser or micro-needle treatments done to get rid of the scarring. If you suffer from stubborn acne, this is definitely a product to ask your dermatologist about. Just keep in mind that everyone is different. If you guys ever wanted to read a post about my struggles with acne and what products worked, which didn’t, what helped me, etc., let me know! Laura Mercier Highlighter, Dior’s Fluid Stick In Avant Garde, Givenchy’s Rose Caprice and Maybelline’s I Like To Mauve It. 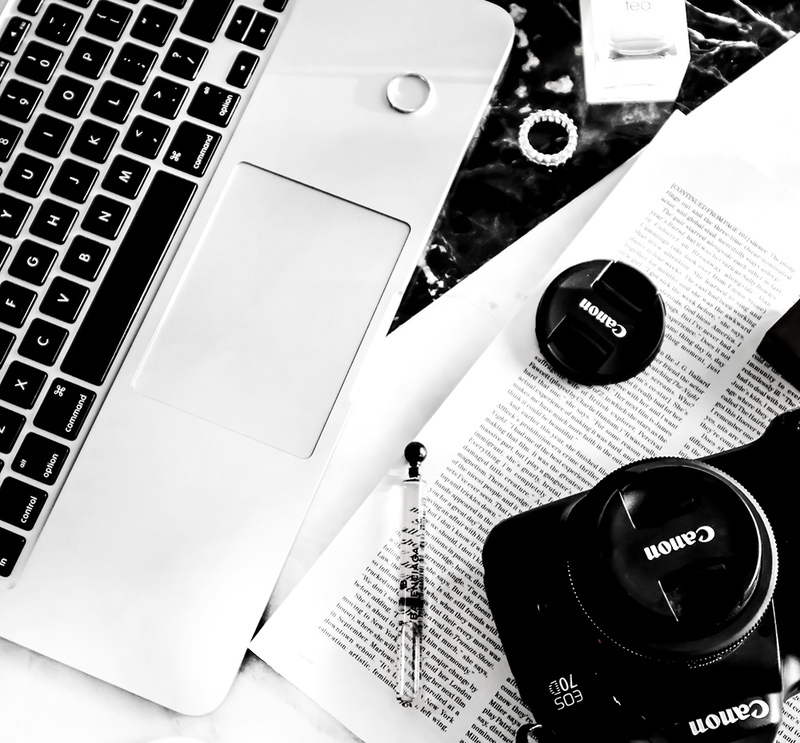 What are some products that you’ve been loving lately?